Thanks to the long standing support of Jos Nolle of Niagara College, Canada, two CIDA volunteers, Cassandra Musungayi and Lindsay Corolis worked with the Pro-Forest Foundation from July, 2011 to January, 2012. The work of Cassandra focused on environmental education with school kids in surrounding communities adjacent to the Cerro Blanco Protected Forest. Cassandra's efforts were focused in the village of Puerto Hondo, where she carried out weekly environmental education activities with kids from the Marianita de Rodas school and the youth environmental education club. 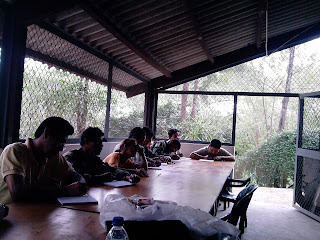 Cassandra also organized and put on a English course for staff of the Pro-Forest Foundation, which was well received. Lindsay's work focused on designing materials to be used in the EA activities as well as help promoting the work of the Pro-Forest Foundation and Cerro Blanco Protected Forest through the internet. Thank you both for your help and support!